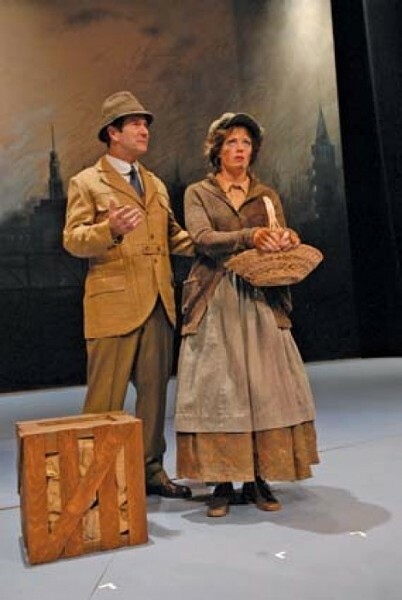 Theater | Good to Fair: Short Shorts and My Fair Lady kick off the Salt Lake City theater season. Wasatch Theatre Company’s Page-to Stage Short Shorts Festival incorporates ingredients that could make for a long and unrewarding night of theater: nonexistent sets, sparse props, and previously unproduced scripts by local playwrights. But as it turns out, the blank stage works fine as do the props. Even better, the scripts are almost uniformly high caliber. And as we’ve seen them do before, WTC and its partners create a memorable night of theater largely by pulling entertaining performances out of both experienced and relatively amateur actors. For the three-week festival, WTC and the Utah Association of Community Theatres join forces to promote the state’s bounty of locally produced theater. The very term “community theater” may inspire thoughts of tiresome Music Man renditions, but these underappreciated playwrights, directors and actors had something edgier in mind. That was obvious a few minutes into the opening play, Jim Lord’s Hot Spot, in which an unsavory couple (Nancy McAffee and Matt Mascaro) find themselves in a café where just desserts are served. It’s a funny representation of hell buoyed by Mascaro’s understated performance. Actually, most of the one-acts are comedies, which is to be expected in a setting where there’s not much time to build up the suspense or pathos necessary for drama. The exception was Linda Eyring’s Torrid, a conversation between a dying woman and her grandmother that veered close to, but didn’t sink into, the maudlin—partly because of fine work, again, by its actors (Clara Susan Morey II—whose humor comes across as delightfully deadpan in both her short-shorts roles—and Lindsay Marriott). Organizers wisely kept the evening’s less-compelling shows in the middle of the set. Gene Washington’s Beckett’s Destination and L. Isabella Iasella’s Kurosawa, Sake, and Lovers and Strangers weren’t bad; they just didn’t quite measure up to the strong shows that bookended them. In Alan Jay Lerner and Frederick Loewe’s adaptation of George Bernard Shaw’s Pygmalion, misanthropic academic Dr. Henry Higgins (Paul De Boy) makes a bet with his friend Col. Pickering (Max Robinson) that he can teach humble Cockney flower girl Eliza Doolittle (Elizabeth Stanley) to speak like a cultured lady. And in Pioneer Theatre Company’s current production of My Fair Lady, we hope desperately that he succeeds—and fast—so that we can understand what the hell Eliza is saying. Perhaps it’s unfair to begin with the negative. After all, director Charles Morey’s staging is in many ways a delightful interpretation of the beloved 1956 musical. His always spot-on sense of comic timing elevates silences as well as Lerner’s sparkling dialogue; the energy remains high when Patti D’Beck’s lively choreography takes center stage. Even the costumes become a show-stopper—which actually should be no surprise, given the PTC track record of designer Susan Branch. And of course there are the songs, as magnificent a collection of instantly recognizable show tunes—“I Could Have Danced All Night,” “On the Street Where You Live,” “Get Me to the Church on Time,” “Show Me”—as any musical of Broadway’s Golden Age. But in the first-act scenes before Eliza masters “The Rain in Spain,” there’s the matter of Stanley’s Cockney trill. And good luck trying to make out much of anything, unless you already know the show by heart. Jeff Brooks—as Eliza’s ne’er-do-well father Alfred—somehow manages the dialect while still remaining understandable, but Stanley’s version practically requires subtitles. She’s a gorgeous singer, which comes through in her shining solos like “I Could Have Danced All Night” and “Show Me.” Her tones, however, do little to make the lyrics for “Wouldn’t It Be Lover-ly?” comprehensible.